The Fifty Best held a “blind” tasting of recent release world sparkling wines with 15 pre-qualified wine judges. Strict tasting rules were applied. The order of service was established beforehand by lottery. 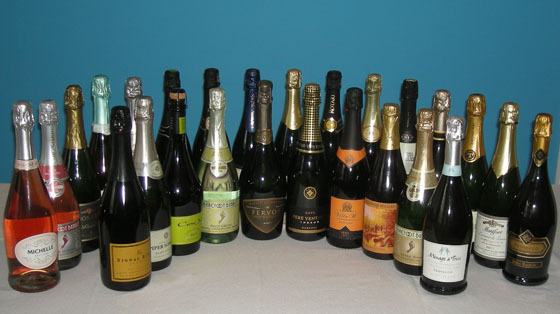 Flavored sparkling wines were tasted and scored separately as a group. Each of the sparkling wines were poured into fresh glasses from new sealed bottles and served well chilled. Only ice water and peasant bread were available to cleanse the palate. This wine is made by the traditional Champagne method from a blend of Xarel-lo (40%), Macabeo (20%) and Parellada (29%) grapes grown in high elevation, chalky soils, with over 18 months of bottle aging. It makes a good mate for hard cheeses and Asian cuisine. Aroma: Sweet tropical fruit, strawberry, kiwi, ripe apple, fresh meyer lemon, citrus, earth, mineral, chalk, shale. Palate: Honeydew, strawberry, lemon, citrus, crisp apple, tart, herbal, nuts, toast, savory, fresh, balanced acidity, zesty acidity, dry, refreshing, a great experience. Finish: Lemon fresh, citrus, sweet, mineral, clean, beautiful. Made by the traditional Champagne method from 100% Chardonnay grapes, this wine spends at over 24 months in the bottle (on the lees) prior to disgorgement and dosage. It mates well with grilled tuna and swordfish. Aroma: Melon, pear, lemon/lime, faint black cherry, sugar cookie, almond, floral, grass, toasty elements, round, complex autolysis, elegant minerality. Palate: Pear, golden apple, apple peel, lemon zest, sweet fruit, floral, herbal, mineral, wood, round mouthfeel, savory, balanced, Old World style, pleasant. Finish: Rich, woody, round minerality, complex. This wine is produced by the traditional Champagne method from a blend of Chardonnay (89%) and Pinot Noir (11%) grown in Mendocino. It marries well with a wide range of fare from grilled salmon to baked chicken to pasta with creamy sauces. Aroma: Ripe yellow apple, citrus, almond, olive, herbaceous, crisp, wood. Palate: Vibrant fruit, white peach, orange zest, citrus, olive, almond, nutty, cigar box, wood, balanced, nice complexity, rich mouthfeel, everything you want in a sparkler. Finish: Peppery, mineral, clean, dry. This wine is produced by the traditional Champagne method from a blend of Chardonnay (60%), Pinot Noir (15%) and Pinot Meunier (25%) grapes that are aged on the lees for 18 months with approximately 25% of reserve wine added to the blend. Try it with crab cakes or shrimp scampi. Aroma: Green apple, lychee, bright citrus, apricot, stone fruit, brioche, leather, good Old World minerality, flint, chalk. Palate: Tart green apple, apple peel, lemon, mineral, oak, good balance. Finish: Lemon peel, mineral, dry, good acidity, nice. This wine is produced by the traditional Champagne method from a blend of Pinot Noir (93%) and Pinot Meunier (7%) grapes grown in the Columbia Valley, with aging on the lees for approximately 18 months. This wine is equally good for toasting and to accompany fresh fruit and flavorful cheeses. Aroma: Cherry, strawberry, pear, green apple, pleasant fruit, spring blossom, floral, honey. Palate: Strawberry, raspberry, cherry, plum, green apple, apple peel, lemon meringue pie, floral, toast, dusty, bright snap, pleasant, elegant. Finish: Citrus, green tropical fruit, gentle, tangy, refreshing. This wine is a blend of hand-picked Chardonnay (92%) and Pinot Noir (8%) grapes grown in the Bio Bio Valley (one of the world’s southernmost wine regions – noted for a cool, sunny climate). Grapes are processed by the Charmat (tank fermentation) method, and the wine is aged for 4 months in steel tanks and 4 months in barrels. Try it with seafood and salads. Aroma: Grapefruit, melon, peach, baked bread, toast, dusty, earth, mineral, hay, tobacco, wood barrel. Palate: Tropical fruit, orange blossom, light peach, black cherry, floral, fresh, bright, good acidity, wood notes. Finish: Lemon, citrus, crisp apple, zesty, dry, nice minerality. This wine hails from the Bruwer family in Robertson Valley along the Breede River, and is made from a blend of Pinot Noir and Muscat de Frontagnan grapes. Aroma: Grapefruit, citrus, plum, peach, nectar, sweet berries, moscato, floral, almond cookie, crisp. Palate: White peach, strawberry jam, strawberry, sweet, fresh, crisp, pleasant, sophisticated. Made by the traditional Champagne method from a blend of Chenin Blanc (80%) and Chardonnay (20%), this wine spends over 12 months on the lees. Mates well with blue-veined cheeses and chocolate. Aroma: Apple peel, bread, pastry dough, pepper, vegetal, clove, chalk, mineral, bright. Palate: Melon, pear, sour apple, green pepper, red pepper, pastry dough, terroir driven, well balanced, elegant. Finish: Lemon, pepper, mineral, earth, crisp, complex. This wine is made from 100% Chardonnay grapes. A good match with grilled salmon. Aroma: Melon, watermelon, cantaloupe, juicy peach, papaya, pineapple/orange, tropical fruit, cherry, fruit forward, white blossom, floral, pretty, sweet aromatics. Palate: Grapefruit, melon, tropical fruit, mineral, effervescent, nice refreshing fun. Finish: Tropical fruit, cantaloupe, sour cherry, high acidity, fresh, clean, refreshing, nice zest, pleasing length. This wine is made from a blend of “free-run” juice of hand-harvested Macabeo, Zarel-lo and Parellada grapes from the Penedes region. Indigenous yeast is used for the second fermentation (in the bottle) with over 24 months of aging before disgorgement. It goes well with tapas such as shrimp a la plancha and baked octopus. Aroma: Apple, white grape, pear, dried apricot, earth, good autolysis complexity. Palate: Lemon, lime, citrus, wild strawberry, cherry, mango, green grapes, good integration of fruit & yeast, flint, leather, smoky. Finish: Lemon, melon, smoke, clean, dry, good acidity, lovely, classic. Made from Moscato grapes by a cool fermentation, with vinification stopped to allow natural grape sugars to remain in the wine. This bubbly mates well with spicy Asian or Mexican fare. Aroma: Cherry, peach jam, ripe peach, pineapple, floral, lavender, mint, beautiful. Palate: Melon, apple, sweet dark cherry, floral, smoky, high dosage. Finish: Melon, citrus, nice, easy to drink. Made by the classic Champagne method from 100% Chardonnay grapes, this wine is first aged in a combination of stainless steel and French oak and then on the lees in the bottle for over 2 years. Perfect for toasting as well as an excellent mate for chicken and seafare. Aroma: Apple, melon, strawberry, apricot, creamy, lemon curd, floral, biscuit, yeast, mineral, earth, woody notes, fresh. Palate: Lemon, lemon peel, citrus, green apple, peach, toast, nice creaminess, pleasant, refreshing acidity, nice balance. Finish: Lemon, grape skin, clean, dry. This wine is made from 100% Prosecco (Glera) grapes grown in the Prosecco DOC area (in the Veneto). It makes a good aperitif wine, but also matches with a range of appetizers from smoked salmon to prosciutto. Aroma: Apple, apple peel, pear, grapefruit, 7up, honey, light cinnamon, floral, rose petal, vibrant. Palate: Pear, peach, citrus, tropical fruit, lychee, hint of apricot, floral, moderately sweet. Finish: Apple, touch of citrus, clean, dry, lovely, easy picnic wine. Produced by the traditional Champagne method from a blend of Chardonnay (50%) and Pinot Noir (50%) grapes grown in the Golan Heights, this wine is aged in the bottle for over a year. It mates well with a wide range of hors d’ouevres from smoked salmon to spanakopita to paté. Aroma: Lemon, lemon/lime, floral, mineral, earth. Palate: Lemon, green apple, light peach, cherry, mineral, earthy notes, zesty acidity, balanced, bright, lively. Finish: Lemon/lime, tart green apples, sour apple, dry, elegant. This wine is made by the classic Champagne method from 100% Chardonnay grapes grown in the Valle dei Laghi and the Trento hills, with over 15 months of aging on the lees. It marries well with pasta with white sauce and delicate seafare dishes. Aroma: Apple, caramelized sugar, toasted bourbon barrel, wood, light mineral, nice, elegant. Palate: Apple peel, melon, brown sugar, forest floor, slate, bold, mellow, easy drinking. Finish: Lemon, spicy, smoky, clean, fresh. This wine is produced from 100% Prosecco (Glera) grapes grown in Italy’s Veneto region, with fermentations taking place in stainless steel vats. It mates well with mild cheeses. Aroma: Lemon, citrus, honeydew, honey, floral, wet stones, chalk, wood, elegant. Palate: Sweet berries, cherry, banana, honeydew, pear, grapefruit, lemon peel, citrus, dusty, mineral, effervescent, wood, well integrated fruit & oak, savory. Finish: Soft, clean, dry, nice, vibrant, lovely. Made by the traditional Champagne method from a blend of Chardonnay (63%), Pinot Noir (19%) and Pinot Gris (18%) grapes from the Columbia Valley, this wine is aged on the lees for almost 18 months. Try it with pasta primavera or grilled chicken. Aroma: Golden apple, lemon, lime, nectarine, cherry, banana, floral, honey, sugar, wood, pleasant. Palate: White peach, golden apple, watermelon, granular sugar, fresh. Finish: Honey, sweet, soft, light, elegant. Made from Chardonnay grapes, this wine pairs perfectly with fresh fruit kabobs and chocolaty desserts. Aroma: Vanilla, dough, tropical fruit, pear, ripe peach, cherry, faint apple, spearmint, floral, beautiful. Palate: Lemon zest, melon, pear, cherry, red licorice, citrus, pleasant. This wine is produced by the traditional Champagne method from a blend Of Chardonnay (50%) and Pinot Noir (50%) grapes grown in the western part of Chile’s Colchagua Valley. It makes good accompaniment for gravlax and oysters. Aroma: Fruity, herbal, chamomile, olive, wood, fragrant, pleasant. Palate: Citrus, grapefruit, golden apple, good fruit & yeast, forest floor, mint, resin, creamy, crisp, effervescent. Finish: Citrus, mango, mint, peppery clean. 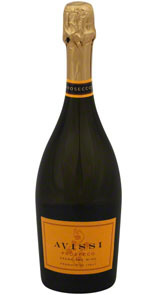 This wine is produced in the Dolomites from Pinot Nero and Chardonnay grapes by the classic Champagne method. It provides good accompaniment for appetizers such as Caprese salad and shrimp cocktail, as well as rich desserts like chocolate mousse. Aroma: Red plum, strawberry, raspberry, lemon/lime, apple, pinot noir grapes, mineral, earth. Palate: Strawberry, sweet berries, red raspberry, red plum, peaches, grape peel, mineral, earth, smoke, well balanced. Finish: Good acidity, spicy, earth, smoke, clean, elegant. Made by the traditional Champagne method from 100% Pinot Noir grapes grown sustainably in the Santa Lucia Highlands, the wine was bottle aged on the lees for over two years prior to disgorgement. It marries well with grilled scallops, salmon and even veal chops. Aroma: Honey, vanilla, pastry, biscuit, raspberry jam, pear, lemon, olive, allspice, tobacco, smoky, old oak. Palate: Tropical fruit, pear, apple, citrus, rich fruit, pleasant ripe fruit, fruit forward, pastry, smoke, complex, good acidity, nice balance. Finish: Buttery, oak, high acid, good acidity, bright, light, dry, persistent. Made from a blend of hand-picked Russian Valley Chardonnay (95%) and Pinot Noir (5%) grapes by the traditional Champagne method, this wine is aged on the lees for 16 months and then blended with approximately 24% “reserve” wine. It makes good accompaniment for fried calamari and scallops. Aroma: Green apple, ripe pear, dried fruit, biscuit, toast, pepper. Palate: Apples, golden apple, pear, melon, lemon/lime, muted fruit, vanilla, olive, a little spice, round, zesty acidity. Finish: Lemon, golden apple, white pepper, clean, crisp, complex. This wine is produced by the classic Champagne method from Riesling grapes grown in the Moselle Valley. It makes an excellent mate for spicy Asian fare and sushi, as well as traditional German specialties like sauerbraten and weinerschnitzel. Aroma: Melon, green apple, apple juice, peach, apricot, muscat grape, muscato, honey, floral, grassy, aromatic. Palate: Melon, kiwi, pineapple, floral, mint, well balanced. Finish: Green apples, mineral, very refreshing. This bubbly is made by the Charmat (tank fermentation) method from 100% Prosecco (Glera) grapes grown in the designated area in the Veneto. Try it with pizza and pasta with red sauce. Aroma: Citrus, sour apple, berries, apricot, light pear, stone fruit, wild flower, biscuit, toast. Palate: Melon, lemon, strawberry, jellied fruit, sugar, clove, saline. Finish: Cantaloupe, sugar, toast, cream. This wine is made from Pinot Grigio (Pinot Gris) grapes by the Charmat Method (in which fermentations take place in stainless steel tanks). Mate it with sushi and chilled shrimp. Aroma: Lime, melon, peach, pineapple, cherry, ripe fruit, custard, anise, floral. Palate: Honeydew, melon, pineapple, strawberry, red berries, sugar, toast. This sparkling wine is naturally fermented from a blend of French Colombard and Chardonnay grapes with almond flavor added. It pairs well with fresh fruit and creamy cheeses such as brie. Palate: Almond, marzipan, cream, raisin, high sugars, woodsy, balanced. Finish: Caramel, crisp, clean, fun. Less than 300 cases of this natural fruit sparkling wine were made. It provides good accompaniment for soups, salads and rich desserts like bread pudding and cream pies. Aroma: Pomegranate, grenadine, red currant, rhubarb, huckleberry, grape juice, green fruit, spice, pretty. Palate: Pomegranate, cherry, grenadine, caramel, tannic bite, balanced. Finish: Brown sugar, sweet, refreshing.